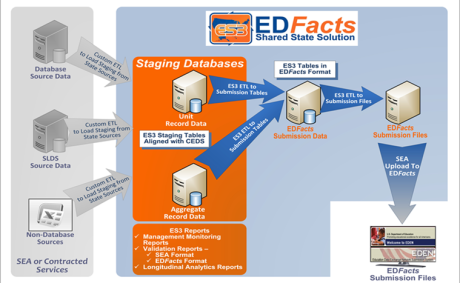 The EDFacts Shared State Solution (ES3) is a complete system for a state’s EDFacts reporting. Both unit and aggregate staging databases hold a state’s data for automated translation to compliant submission files. ESP maintains the annual EDFacts requirements for participating states in the ES3 consortium. A UI manages steps and reports provide audit assistance. The EDFacts Shared State Solution (ES3) was developed by ESP Solutions Group, Inc. in partnership with several state education agencies (SEAs) pooling resources and ideas for a common architecture that solves the challenge of fulfilling the requirements of the U.S. Department of Education’s EDFacts reporting system. 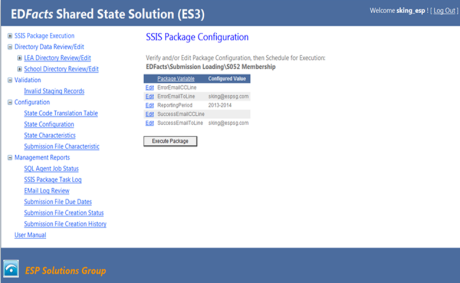 Click the logo above to view Steve King's PowerPoint Introduction to ES3. powerful tool that provides graphically enhanced, meaningful, and timely reports/visualizations of EDFacts comparative data when uploaded. EDFacts D&A currently includes 12 workbooks with 57 dashboard visualizations. 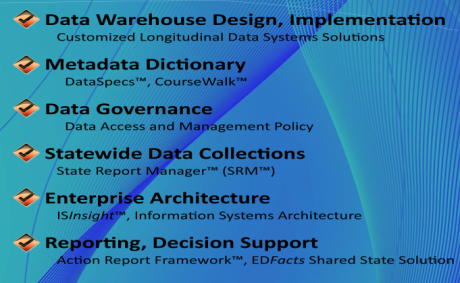 EDFacts D&A was built as a companion for the EDFacts Shared State Solution (ES3), however any state may utilize and benefit from EDFacts Dashboards and Analytics! Click to see a standard proposal for an SEA.